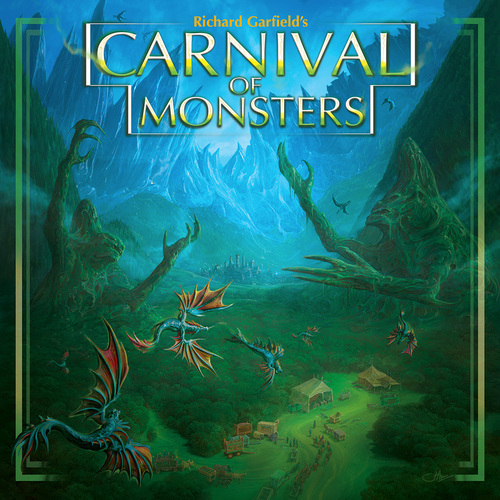 In this new prototype game, players act as competing carnival owners trying to collect the most important set of monsters in order to create the best carnival. The game is apparently close to complete as far as the gameplay goes, but this game is taking a novel approach to its production. It appears that AMIGO is setting up a Kickstarter campaign in order to fund the highest possible quality art for the cards. As you might expect with a game from Richard Garfield, the game has plenty of different cards, each with some special abilities. In the set that I am currently playing with, there are 240 different cards, and one of the goals I heard them talking about is to have distinct card are for every card in the game. The game is played over four rounds (called Seasons). 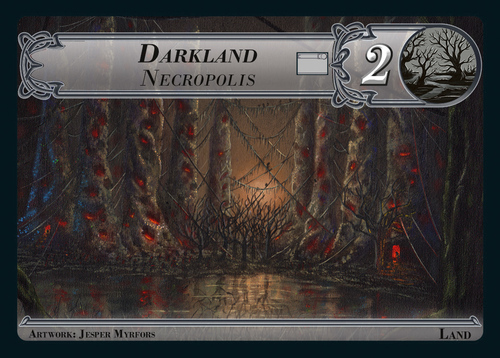 At the start of each round, a season card is revealed – this shows a bonus possibility for the end of the round for having the most monsters of a certain type. There is also a one-time bonus that all players can achieve this round for playing a card of a particular type. Each player is then dealt 8 cards. They are examined and then each player “captures” one of the cards by placing it face down in front of him. The remainder of the hand is passed to the next player, and they are put facedown in a special place on the player board. Now, each player returns their attention to the captured card from this round. Players can choose to Play the card or Keep the card. There are five main types of cards – Land cards, Creature cards, Staff Cards, Event Cards, and Secret Goal cards. 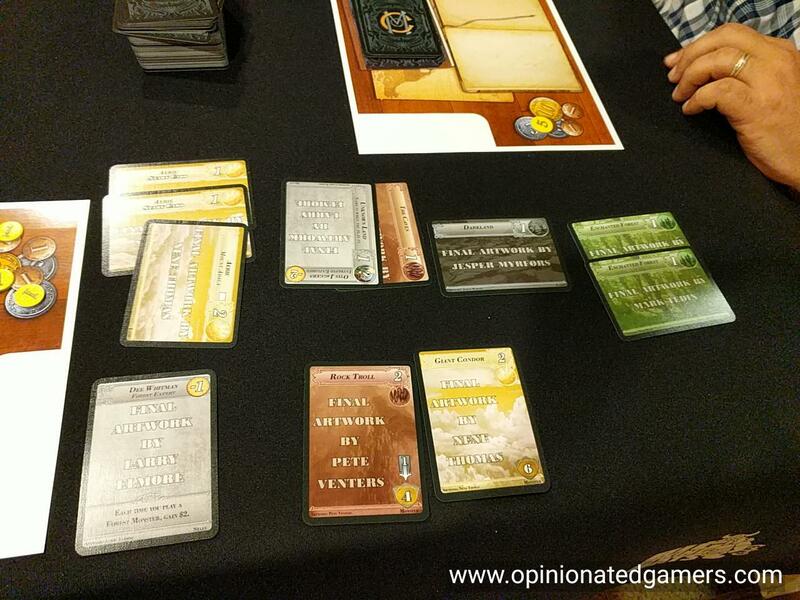 Most land cards can be freely played to the table, though some require previously played cards of the same suit. There are six different types of lands. These land cards are used to pay for the cost of playing Creature cards. Note that Land cards can only be used once a Season to capture a Monster though. Each Creature card has a cost of land points in the upper right corner – you must have this number of land points showing on the table in front of you in order to play that creature. Note that some Creatures also have a danger rating on them. This will become important later in the round. Some creature cards also allow to draw a facedown card from the deck to be placed in the Kept Cards stack. Staff Cards give special effects that are on-going for the rest of the game. There is a cost in gold coins in the upper right of the card. Event cards are one-use special ability cards, but they have the advantage of having no cost to play (unlike the Staff cards). Secret Goal Cards are never played. They are placed in your Kept cards pile and revealed at the end of the game. Each of them has conditions on them which allow you to score points at the end of the game. Again, you can choose to play you card. If you cannot play your card OR if you don’t want to play your card, you can keep it. It costs 1 coin to do so. If you do not have enough money, you can always take out a loan which grants you 3 coins but will cost you 5 VP at the end of the game if not repaid. Cards that are in your Kept Cards pile can be retrieved and played at almost any time in the game so long as you have the necessary prerequisites to play that card. Once each player has dealt with their captured card, they pick up the hand that was passed to them and choose a new card to capture for the next round. This continues until all players have captured 8 cards and chosen to play/keep each of them. 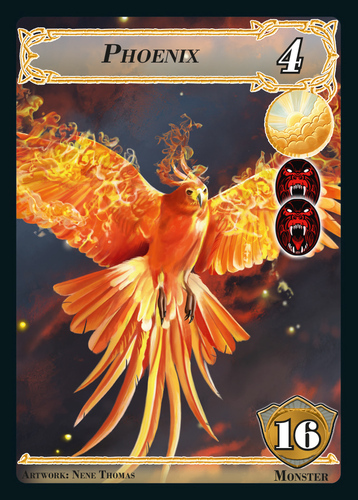 Once all eight cards have been dealt with for the round, there is a Danger Check – each player must have enough Hunters available to match all of the Danger icons on their played creatures. A die is rolled which shows 0, 1 or 2 Royal Hunters on it. All players will get this number of hunters as their base value for the round. This number can be supplemented with Hunters or Hunter tokens which are generated from Staff and Event cards. As long as you have more Hunters than Danger icons, you’re good. If you do not have enough, you will have to pay a 3 coin penalty for each Hunter short. Again, if you do not have enough coins, you’ll have to take out Loans to pay for them. Now, the season moves into the trophy phase. Each player counts of the VP value of the played creatures that match the type specified on the Season card. The player with the highest total takes the card (and the bonus VPs that are on it) and puts it in his scoring pile. All of the played monsters are then removed into each player’s scoring pile. 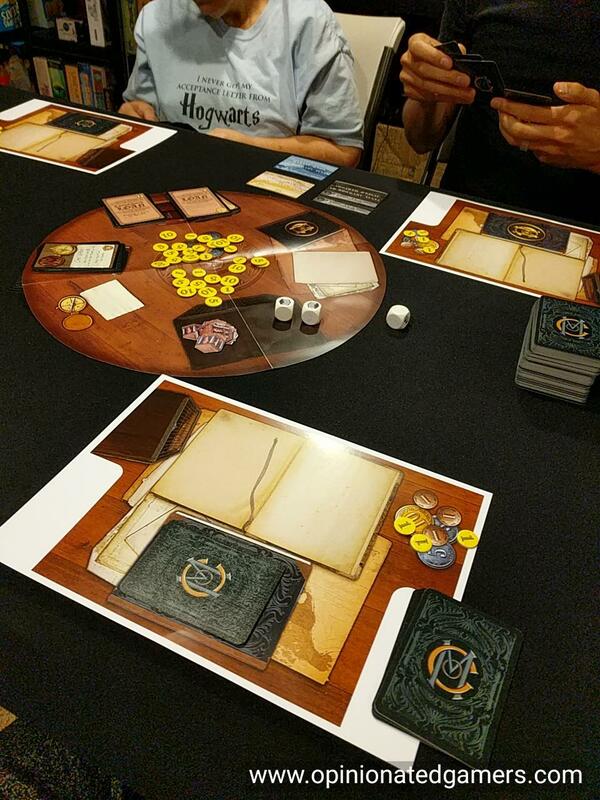 All of the Land cards remain on the table to be used again in the next round. They are all reoriented to show that they are all available for use in the next season. The player with the most VP wins! Carnival of Monsters (CoM) is a game filled with familiar concepts from Mr. Garfield. The main mechanism here is the card drafting – spread out over four different seasons. One of the interesting things about this one for me is the opportunity to draft cards for the end game right from the start. In CoM, there is only a single deck in the game. Therefore, you might see one of the more powerful (and therefore most Valuable) monsters early on in the game, perhaps in your initial hand of the first round. You have the opportunity of select this card on the first round, and keep it in your area at the cost of a coin. As you can play the card at any point later in the game, you could easily draft one of these powerful cards early on, and then use that as the base of your future strategy in the game. Of course, you can’t only plan for the future. In order for you to be able to capture monsters, you have to also be drafting land cards to be used now and in later rounds. Additionally, trying to keep up with the seasonal bonuses can be a valuable source of points. As you can only use each Land card once in a round, you cannot simply wait for the end and score everything at once. There is definitely a good challenge in drafting the right cards at the right time as well as knowing when to play them. Keeping track of your Hunter situation is also a good idea. In the early rounds, this usually isn’t an issue – generally the lower powered Creatures that you are able to put into play in the first two rounds do not come with that many Danger icons. 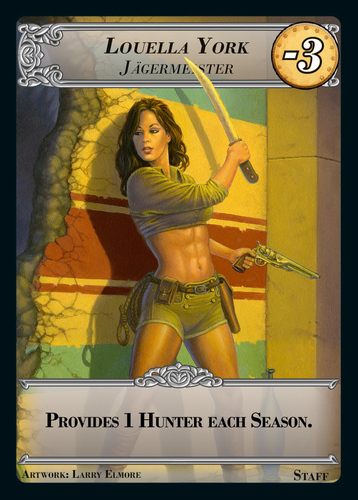 However, throughout the course of the game, I have found it wise to try to stockpile a few Hunter tokens OR Staff cards that help give protection for the final rounds when you’re really trying to get out the larger creatures. The 3VP/missing hunter penalty can be a severe one when it hits you! For some, the single deck has been a negative; and I would agree that it can make a frustrating game on your first few plays – when you are not familiar enough with the cards to be able to make good judgement calls on what is worth saving from an early turn. Yet, only that familiarity is created, there are enough different cards to make this decision challenging at times. Unlike some of Mr. Garfield’s other games, the strategy seems fairly straightforward. While some of the cards have events/actions on them, there is not the same sort of synergistic card effects to wade through like many of his other games. This change leads to a more accessible game, allowing you to include casual gamers easily. The other thing that helps this game appeal to the more casual gamer is the fixed universe of cards. Over the course of the first one or two games, a player will see most of the cards that are in the game – whether in their hand or when played by other players. As my copy is a prototype, I really can’t comment on the cards. In fact, most of the cards in my set do not include any art. The reason for this is that AMIGO is taking a novel approach to Kickstarting. This game is reportedly almost done rules/component-wise. However, AMIGO is trying to raise money to fund the artwork of the game. 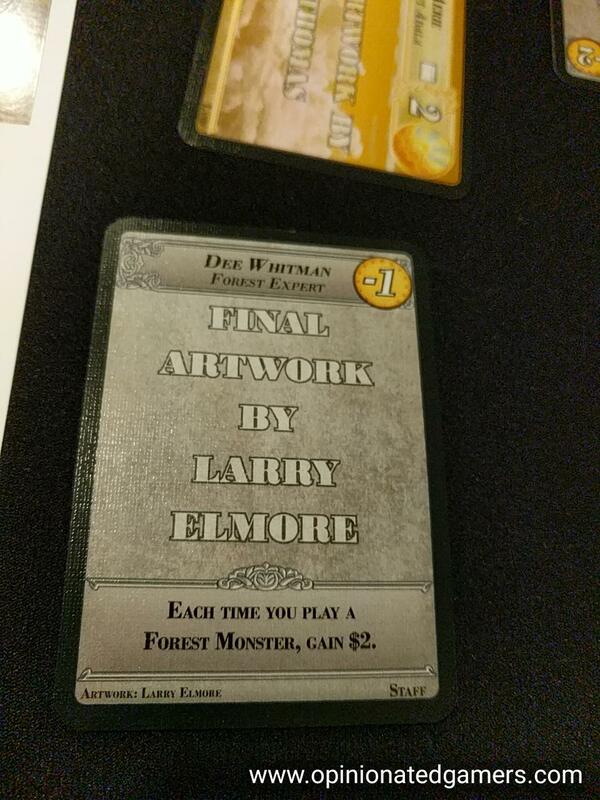 As you would expect with these CCG-like cards, there is room on each one for art, and the plan is to hopefully have different artwork commissioned for each card – by the foremost artists in both the boardgaming and fantasy art worlds including Larry Elmore, Jesper Myfors, Ron Spencer, Drew Tucker, Pete Venters, John Avon, and more. At this time, I’m not entirely sure of the timetable – but I am personally interested to see if this sort of campaign can work. There was a recent press release from AMIGO that says that campaign will go live in “October”. I’m guessing that this will be right after Essen. The planned release will be in Summer 2018 with an estimated MSRP of $54.00. I think that game is definitely close to being done; I could still see some cosmetic changes being made as well as some balancing things done with the card mix – but overall, the game works well and feels finished. Now it just has to look finished! I’ll report back if I get a chance to see the game in a more finished state at SPIEL in Essen… This is one game though that I’ve looking forward to seeing the finished product! This entry was posted in Essen 2017, Preview. Bookmark the permalink. Was it just me that was expecting a John Pertwee Doctor Who game based on the title? Well, they put it up on kickstarter already but it doesn’t look overly optimistic to fund at this point. I don’t think this type of game will do well with a base goal of over $200,000 even if the art is stunning. I will be curious to see if they try again and re-do the campaign.